A local company with a specialization in outdoor construction is what you need when it comes time to repair or replace anything from your driveway to some features of your backyard. Our team offers a wide range of repair, remodeling, and installation services. From simple mailboxes to sturdy paved driveways to outdoor structures like walls and pillars or BBQ and fire pits. If it involves paving-related work in your front or backyard, or the surrounding landscape, our experts can do it. It’s a slight exaggeration – but only slight! Our team can help residents and property owners of all the nearby areas install gazebos and pergolas, paved courtyards, and even water features and quite a few other things! In addition to construction, our company also offers removal and repair services for paved features. Our team will work with you to bring the image in your head into reality, or even help you design that image in the first place, if you’re not yet sure how exactly to develop your idea. Our company deals with a wide variety of property owners and managers, and prides itself on flexibility and understanding. 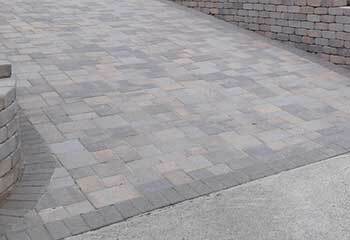 Our pavers take note of the limitations imposed by zoning, timetables, and pricing, and excel in finding a way to work with each and every customer to meet their satisfaction. Just tell us what you need done, and our experts will find a way to do it. A pathway of smooth bricks, tiles, or stone pavers makes for a scenic route to connect your driveway to your backyard, or to other areas of your property. 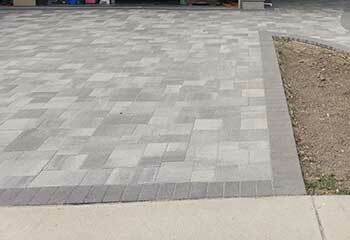 Since such a feature will be exposed to the elements, the pavers used may require the occasional replacement, which is a service our team is also happy to offer. An aesthetic look is something that can really boost your property's curb appeal, and the visual appearance of neglect will have the opposite effect on visitors. Whether you want a small, comfortable sitting area just outside the back door, or an expansive porch deck to serve as an excellent outdoor, our team can build it with a bit of land reshaping and careful paving work. A patio doesn’t have to just be an open space, of course. With the addition of outdoor living features like benches and tables, a walled off area for privacy, or decorations like pillars and columns, it can have all sorts of uses. You can even have more extravagant features built, like a complete outdoor kitchen that can be perfect for breakfast, lunch, and dinner. An outdoor swimming pool needs a clear space to absorb runoff and keep grass, dirt, and all sorts of creepy crawlers away from the water. Whether raised off the ground on pylons or just built around the pool’s edge, a deck can be the difference between a comfortable, appealing swimming area, or a water filled hole in the ground. With the addition of benches, tables, chairs, and other built-in amenities, a pool deck can significantly add to the usability and comfort of your swimming pool area, as well as to its cleanliness and structural integrity. In addition to decks and walkways, our team can also install the pool itself. Outdoor coy ponds and other types of decorative water-utilizing structures have been the hallmark of luxurious and scenic properties for a very long time, and they can be built in a variety of sizes and shapes to best fit the lay and limits of the land. Our experts can build decorative basins, fish ponds, and abstract fountains, to provide a lively natural aesthetic that supplements an ordinary lawn or garden and can even become the main centerpiece. Raised roofs and open air shelters are a must-have if you want your outdoor property to be comfortable for use during rainy weather or punishing sunlight. A pergola or gazebo-style column-supported roofs can be used to protect porches, outdoor kitchens, or even just walkways and driveway areas. It’s also hard to deny that having an open brick or wooden structure as part of your property makes a strong impression on guests and visitors of all kinds, especially when combined with some outdoor furniture or decorative centerpieces. Read our recent work reports to learn more about the latest projects our experts completed. 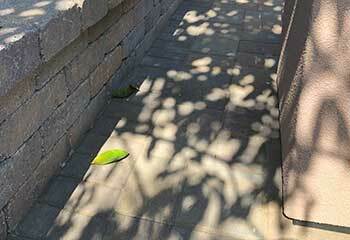 This customer contacted us after noticing parts of his paver driveway were broken. Find out how we helped. Our team helped this customer bring life and vivid curb appeal to the front of this property. Read more here. Our team built a patio wall with pillars for this customer, complementing the architecture of his house. Read more here. Our garden looks so much better after you repaved our walkways and redid the edges. Thank you so much for everything. Our paved courtyard looks absolutely stunning. Your team did a wonderful job. Please thank them all for their hard work. 1. Our new gazebo is just stunning! Your workmanship is quite remarkable, and it was a pleasure working with you to come up with a design. Thanks for everything.